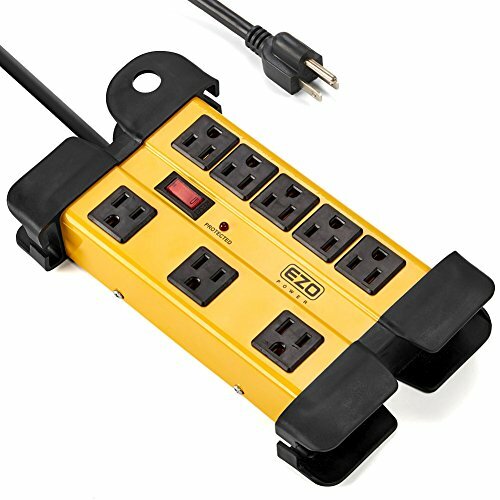 Sturdy, Heavy-Duty Metal Housing and Surge Protection constructed EZOPower Industrial Power Strip is perfect for construction site, labs, and other harsh environments. MULTI OUTLETS: 8 outlets including 3 spaced outlets specially designed to accommodate regular plugs and large AC adapters. SAFETY: ETL Certified / 1200 Joules / LED Indicators / Circuit Breaker to ensure ultra-stability and optimum protection from overcurrent, overloading, and power failures. Protects your devices from electrical surge damage. KEYHOLE MOUNTING: The keyhole mounting tabs installation provides a convenient way for workshops, tables and enclosed garages. CABLE MANAGEMENT: Built in storage for easy storing the 15-feet extension cord when not in use.